Cut the cling peaches into segments. Heat the honey in a medium pot over medium-high heat, add the peach segments and cook briefly, stirring, add the orange juice and simmer briefly until the peaches are just short of tender. Set aside. 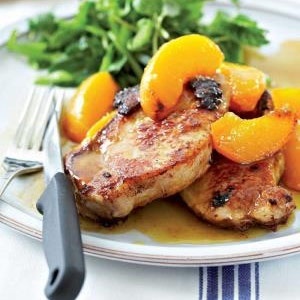 Add the peaches and orange juice to the pan and simmer briefly to deglaze the pan, pour the peaches and sauce over the chops. Serve immediately with the mint, watercress and mangetout salad.